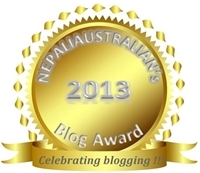 ← It’s the Last Days to Nominate in the NEPALIAUSTRALIAN’s Blog Award 2013! Thank you everyone for getting behind Nepaliaustralian Blog Award 2013 and nominating your favorites blogs. I am so glad to have found some really wonderful blogs in the process. So now the nomination has closed and its time to vote for your favourite blogs to win the title. Following are the nominations in each category. Winner will be announced in January 2014. First all of big congratulations on nomination. Please write a post in your blog about this award or reblog this post so your readers can vote for you. There are buttons at the end of this post for you to share or you can use the link below. Also add the image below with the link on the side bar of your blog so your readers can click there and reach this post to vote for you. You can Facebook or Tweet this post so that many people are aware about your blog and this blog award. This entry was posted in Nepaliaustralian Blog Awards and tagged awards, Best Blog Design 2013, Best Blog for 2013, Best Blog Post of the Year 2013, Best Fashion Blog 2013, Best Fashion Blog Post 2013, Best Food Blog 2013, Best New Blog 2013, Best Personal Blog 2013, Best Photo Blog 2013, Best Photo Blog Post 2013, Best Travel Blog 2013, blog award, blog awards, Blog Design, Blog Post, Fashion Blog, Most Diverse Blog 2013, Most Educational Blog Post 2013, Most Witty Blog Post 2013, Nepaliaustralian Blog Awards, Nepaliaustralian's Blog Awards, personal blog. Bookmark the permalink. Thank you, it’s a lovely gesture during very difficult times. Within the last month my Mum died and now our new home has been badly damaged in the floods, where we lost virtually everything. I’m going to keep the blog going as a tribute to Mum and also to keep myself sane! Thank you so much for considering this even when you are going through tough time. All the best for everything in your life and hope things will be great soon. I am honored at your listing me as your Best Personal Blog of the Year and will be considering this award nomination. I am sort of lazy and not sure I even deserve it! But believe me I appreciate this and will let you know when or if I post about this! I love your blog and I am sure many of your readers too that’s the reason you are nominated 🙂 Take care. Thank-you once again! And what a great list you have! I am beyond flattered right now 🙂 thanks a lot. Thank you for the nomination 🙂 It is an honor! Thank you so much! So flattered! Thank you for the nomination. Wow! I’m both thrilled and surprised. I had no idea. To be chosen from so many blogs. Such an honour. Thank you. Wow! I am very surprised and thrilled to be nominated in the Best Food Blog category. What a thrill! When I started this blog in January my main intention was just to have a place to document what I love to do most: cook for my family and friends. I never imagined that others would enjoy reading as well and I’ve made many friends and learned A LOT. Thanks for the nomination! I truly am not worthy. I hope that you will understand my not voting on these categories. I don’t really know how to rank these things. For me, the best blog post is the next blog post. I always take delight in the blogs that I follow, and I always enjoy finding new blogs. i am siting here this morning with a sparkle of tears in my eyes; wow – i am so very honored that my blog is included in this list! thank you, thank all of you! i’ve been more offline than on for over three months; it’s a blessing and a curse to be unwired and living where celll phone internet signals do not taint the wildness of the cloud forest near mindo ecuador. in a few weeks i should be online more often with a signal that is strong enough to open pages in a timely manner. until then i will remain offline most of teh time, and i look forward to when i can explore many of these blogs and formally thank those who tipped their hats/cursors to my blog. Thank you for nominating me… I am honoured!